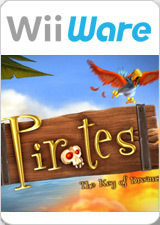 Pirates: The Key of Dreams is a shoot 'em up video game by developers Oxygen Games for WiiWare. A prequel to Oxygen's Nintendo DS game Pirates: Duels on the High Seas, it was released in Europe on July 18, 2008 and in North America on July 21, 2008. The graph below charts the compatibility with Pirates: The Key of Dreams since Dolphin's 2.0 release, listing revisions only where a compatibility change occurred. This page was last edited on 23 September 2017, at 19:04.